This basket was inspired by the few historic examples of baskets made in the late 1800s with circle staves protruding through the rims. In the 35 years of making baskets in the Nantucket Tradition I have been moved to duplicate create and embellish off the rarer forms. In many cases I use recycled materials to lend more historical accuracy and just have fun. This functional little piece inspires thoughts of wonderful times spent on the many islands and beaches of our great Atlantic ocean. 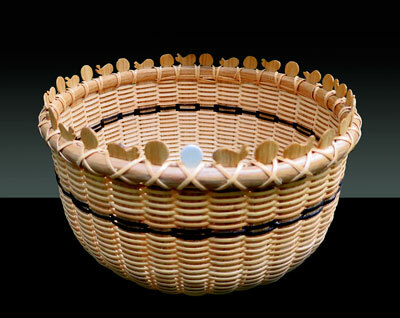 The basket's staves and rims are oak, and the bottom is walnut with 2 turned circles and a bone peg in the center. Weaving is cane with three rounds of baleen obtained from a wash ashore deceased whale. There is one ivory overlay bubble, the ivory being from my grandmother’s 1920 Russian baby grand piano.